BATON ROUGE, La. 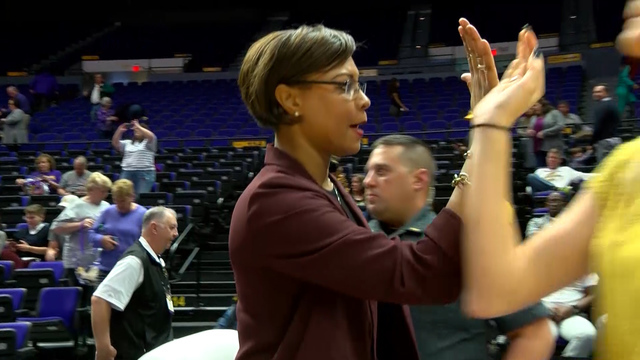 (WVLA) - The LSU women’s basketball team defeated Missouri, 61-51, on Monday night in the PMAC. The Lady Tigers improve to 13-8 overall and 4-5 in the Southeastern conference. With the loss, Missouri falls to 16-7 and 5-4 in conference play. LSU bounced back from a two-game losing skid against Tennessee and nationally ranked Mississippi State with another outstanding defensive effort. LSU’s defense set the tone early in the game until the Lady Tigers’ offense could get in a groove. The Lady Tigers were able to keep Missouri out of rhythm as the game went back-and-forth for much of the first half. Ayana Mitchell led LSU with 17 points and 12 rebounds and notched her 11th double-double of the season. It was a big night for Shanice Norton who scored her 500th career point in an LSU uniform. Norton finished the game with 10 points. On the defensive side, Norton was able to keep Missouri’s Sophie Cunningham to just five points in the second half. Khayla Pointer and Faustine Aifuwa each put up 10 points for the Lady Tigers to round out the balanced attack on the offensive side. LSU forced 17 turnovers on Missouri and scored 17 points off of those turnovers. “Our offensive execution in the second half was generated off of our defensive pressure,” Fargas said. To close out the first half, Norton hit a long jumper at the buzzer to pull LSU within two points. Missouri held its largest lead, seven points, in the second quarter before the Lady Tigers put together a quick 5-0 run. LSU put together a dominant 21-point third quarter and outscored Missouri by 8 to take a comfortable lead. The Lady Tigers carried their momentum into the fourth quarter and shot eight straight free throws to close at the game. LSU will finish its three-game homestand on Thursday, February 7, against Arkansas with tip-off set for 8 p.m.